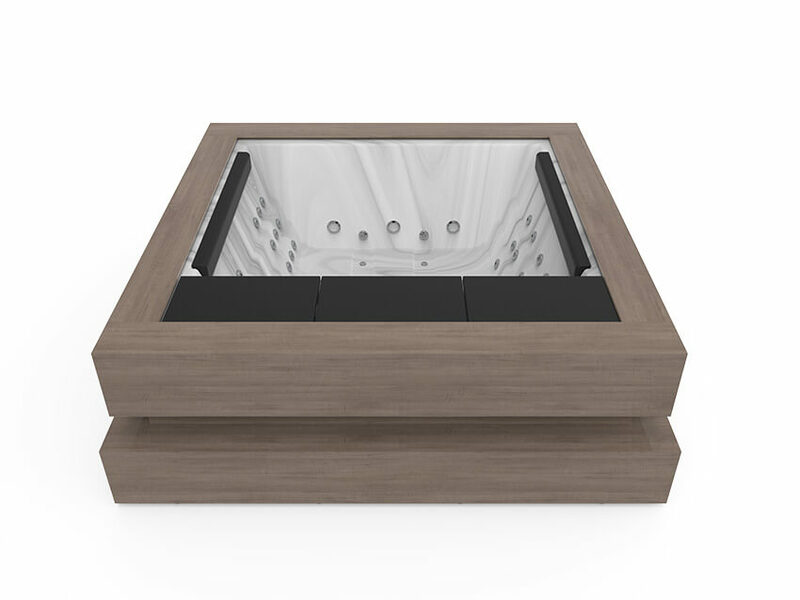 If it were a vehicle, the Spa Cube would be the most elegant luxury car. That’s why it is one of Aquavia Spa’s star creations: the hot tub model for the most exclusive private and residential use. 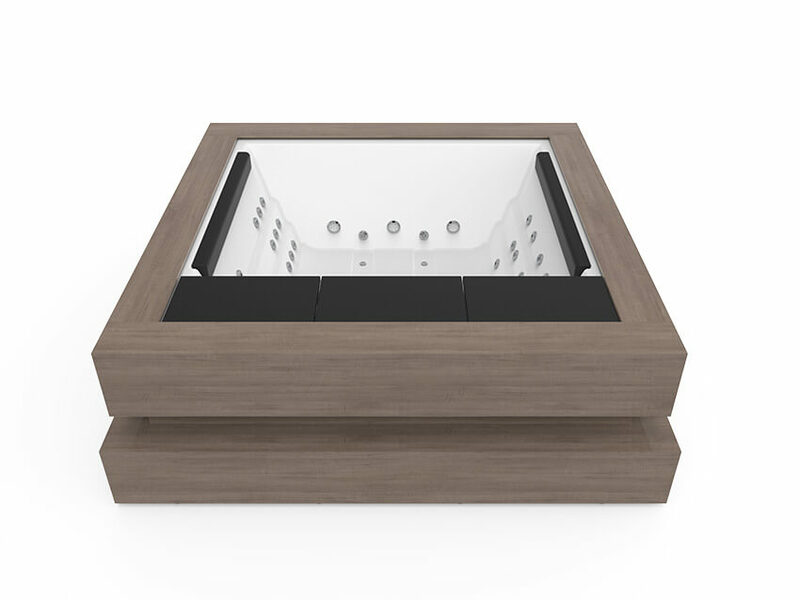 At Aquavia we like to say that the Spa Cube is not just design and engineering, but contemporary architecture. That’s the inspiration behind the concept of this top range hot tub, with its Zen-like minimalist lines. 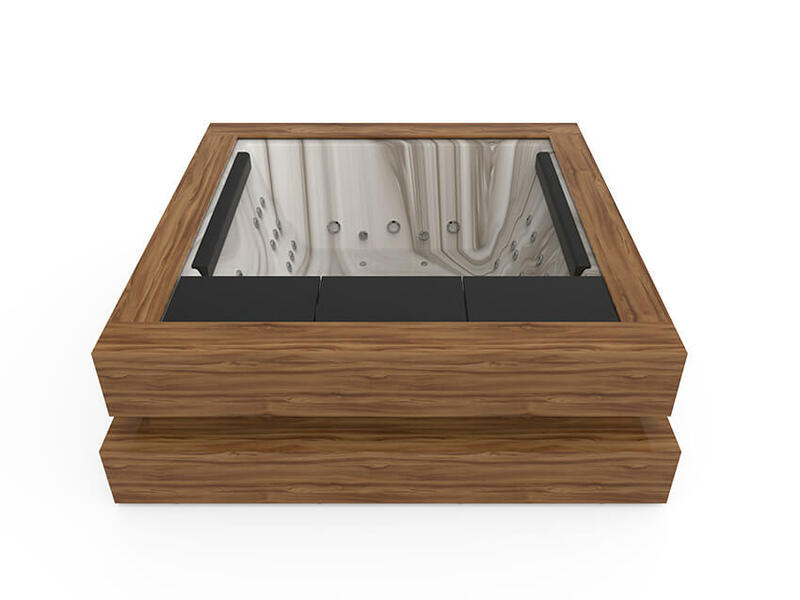 The Cube is the perfect hot tub for design lovers seeking a genuine piece with unique features that can be found nowhere else. It is not easy for a design so understated and elegant to be able to transmit such strong emotions as the Spa Cube. 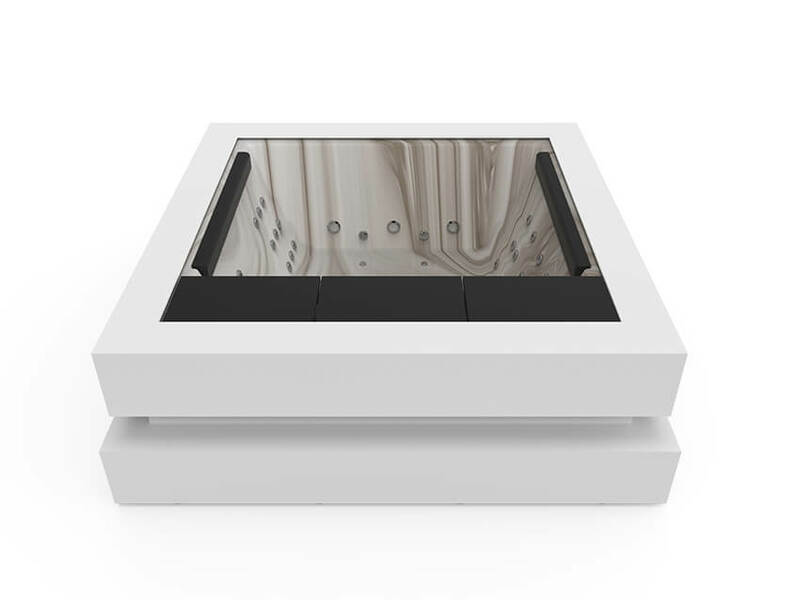 In fact, in seeking to evoke contemporary art, Aquavia decided against an ergonomic structure in this case, in order to let users move with total freedom around the spacious and flexible 4-person space. The Spa Cube is more than just therapeutic or purely relaxing, it is holistic: it seeks physical, mental, and emotional well-being via the five senses. 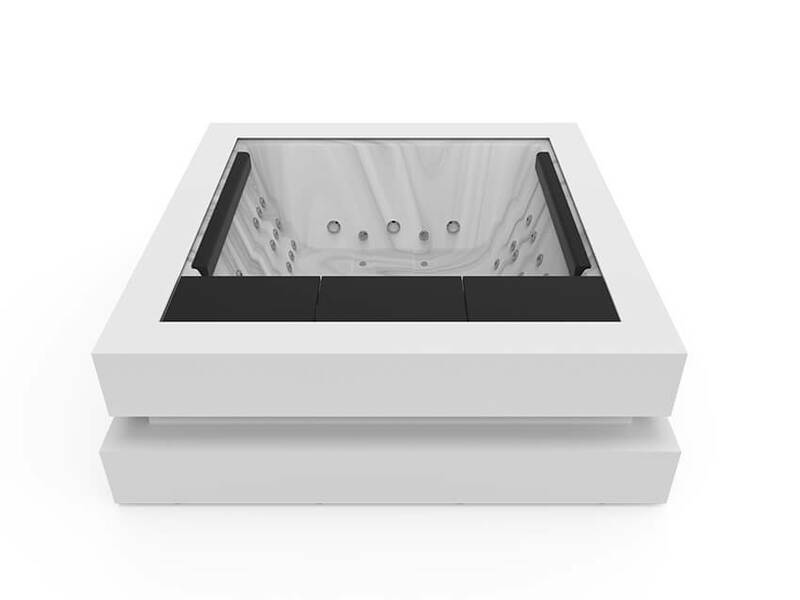 Its 27 pressurised water jets, 12 hot air jets with the Relax Impact System, and all of the small details designed for total comfort create a physical stimulation of incomparable well-being. 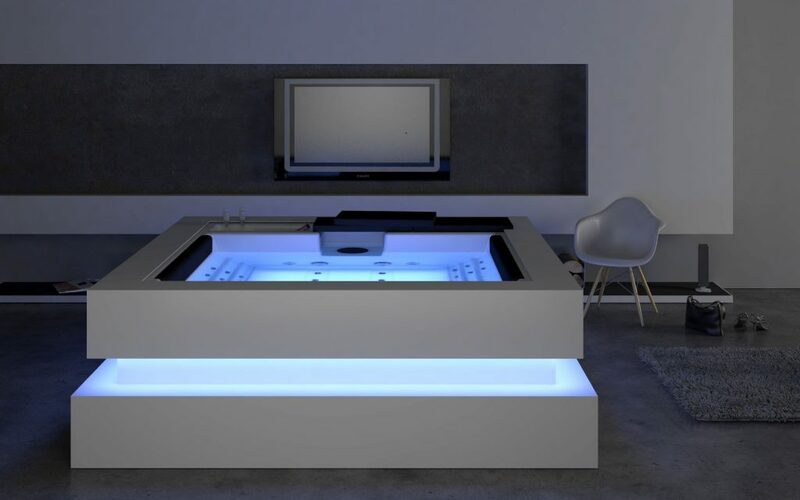 Additionally, the Aromatherapy system releases fragrances into the air in bubbles to transform the hydromassage into a truly beneficial aromatherapy session. These sensations, along with the enveloping sound of the revolutionary Surround Bluetooth Audio system (4 top range speakers and a powerful subwoofer), make the Spa Cube the perfect machine. 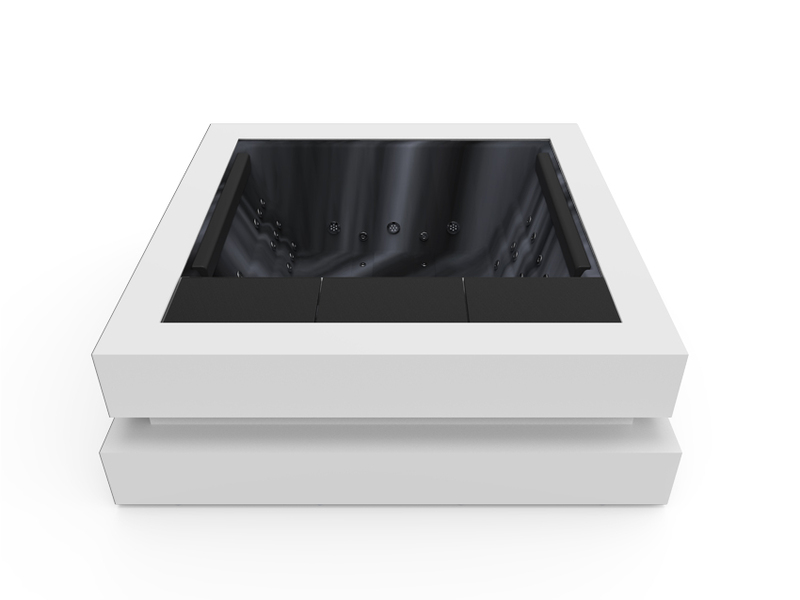 The exclusive Colour Sense feature, with 5 multicoloured LED spotlights inside the hot tub, infuses the water with the selected colour or uses specially-programmed chromotherapy sequences for a fully unique experience: Pure Line Lighting synchronises the light show around the entire perimeter of the sophisticated cabinet with invisible LED dots. The look is truly powerful and spectacular, transforming this work of advanced design into an outstanding addition to any space. 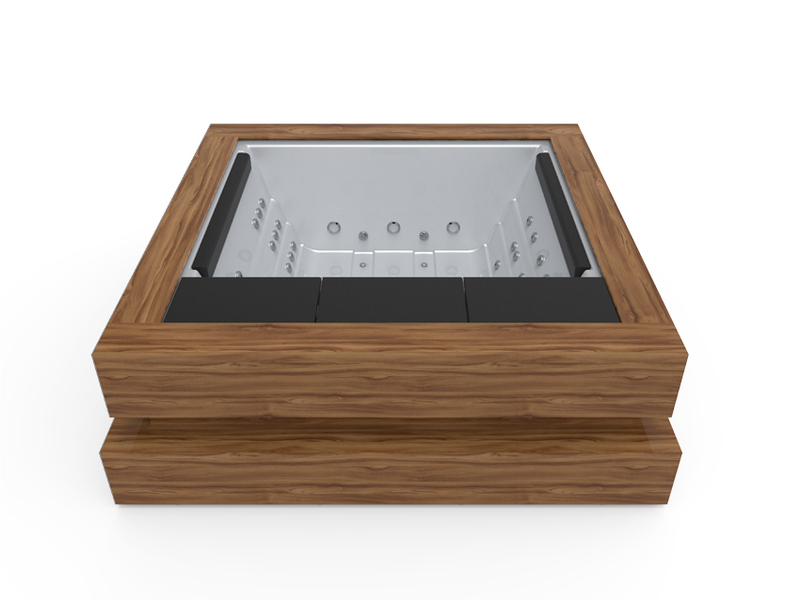 All of these features are controlled using our Balboa panel, which can be made even more sophisticated by adding the Wi-Fi control (Wi-Fi Touch Panel), to control, activate and modify the basic hot tub functions remotely, improving energy efficiency and maintenance savings. 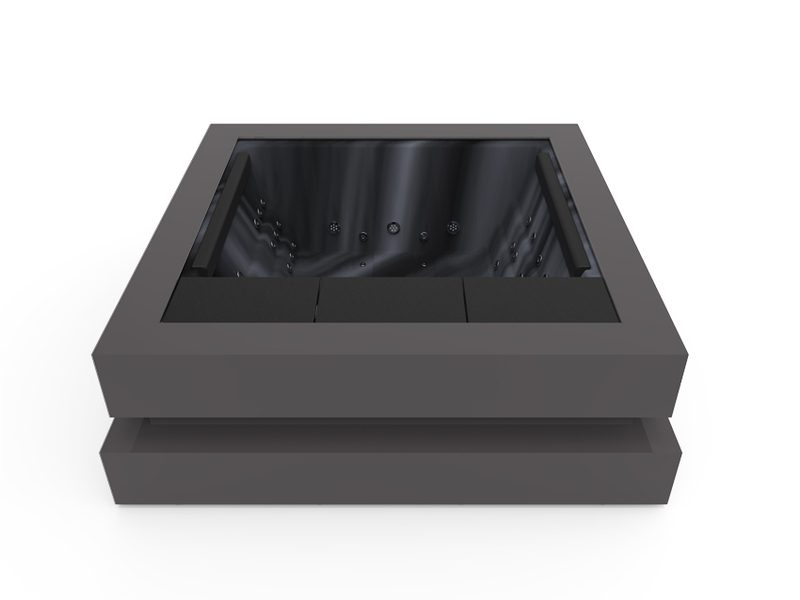 The Spa Cube is a powerful machine with extraordinary efficiency in every sense of the word. In terms of energy, its EcoSpa insulation can be supplemented with the Nordic Insulation System, especially recommended for outdoor installations and guaranteeing 80% energy savings in outside temperatures of up to -15ºC. 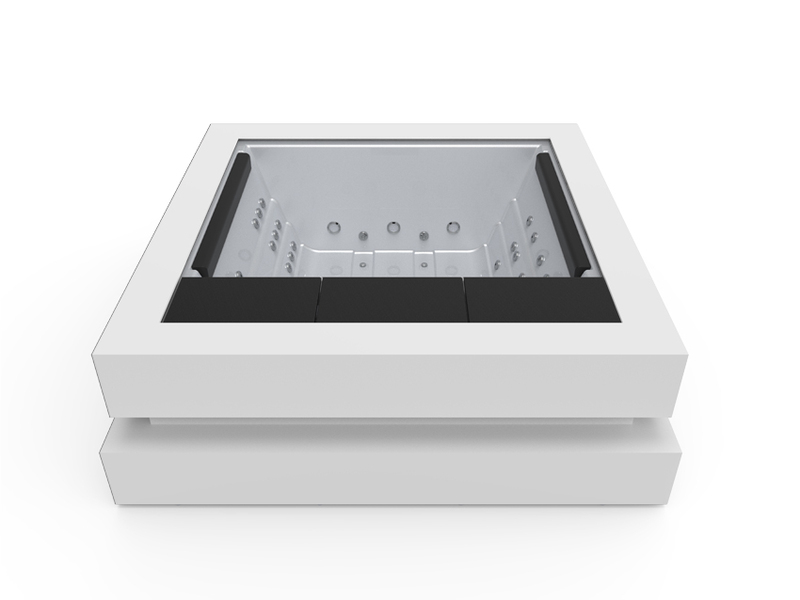 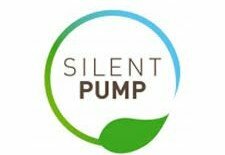 It is also efficient in terms of keeping the water impeccably clear and clean: its ultrasilent Silent Pump filtration system is complemented with the outstanding Ultraviolet Treatment, which uses an ultraviolet (UV) lamp to fully disinfect the water using 80% less of water treatment products. 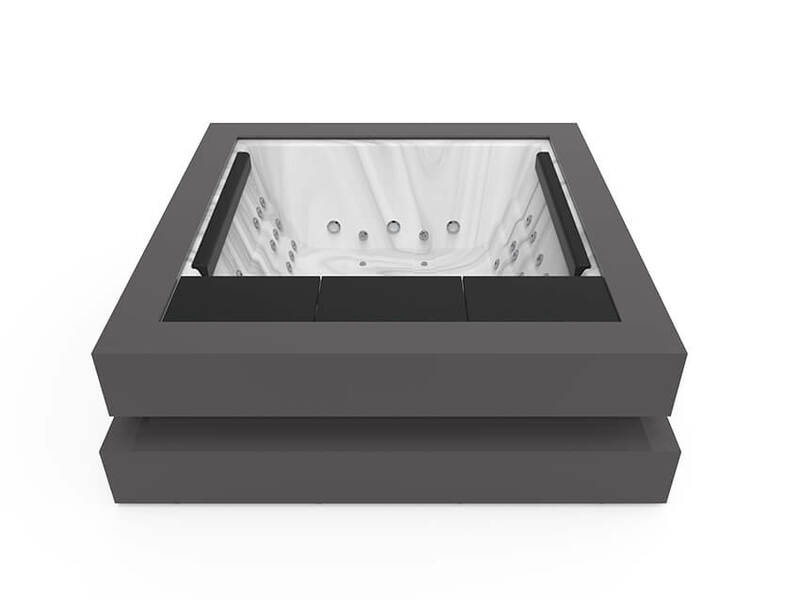 Gone are the days of chlorine smells and reddening of the eyes. 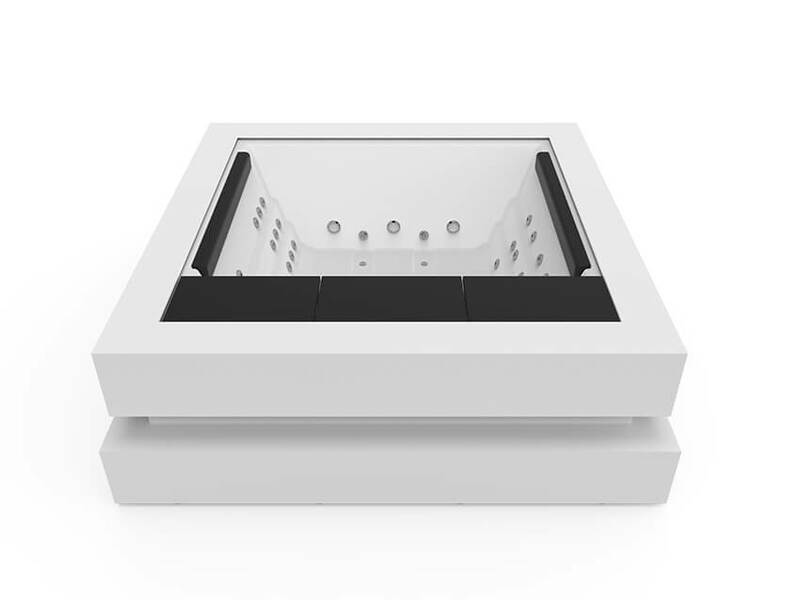 In short, the Cube is a truly luxurious hot tub and a feat of design and engineering, reminiscent of minimalist architecture for lovers of pure perfection.